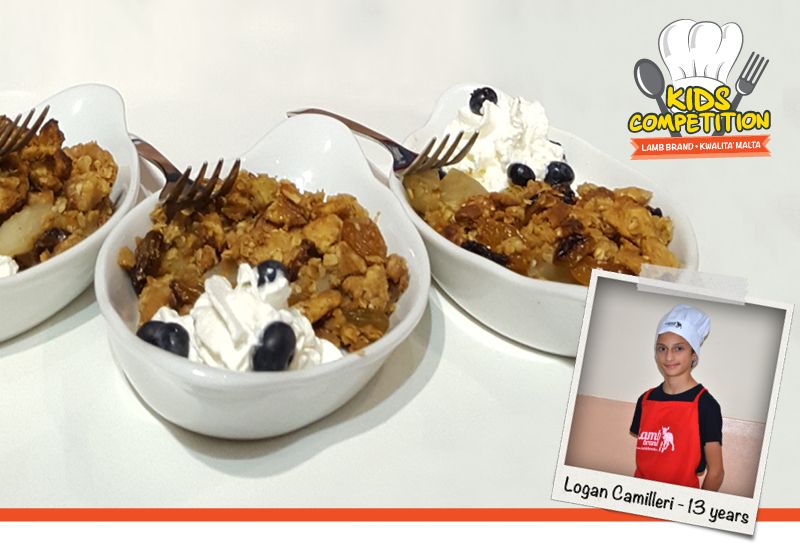 Recipe by Logan Camilleri, Senior category for Lamb Brand Kids Competition during Kwalita Malta 2016. 1. Prepare the fruit by chopping into small cubes. 2. Preheat the oven to 190oC. 3. Crush the biscuits using a rolling pin. Combine with the oats. seeds and the nuts into a large bowl. 4. Put the fruit into a small bowl and mix with the mixed spice. 5. Add the margarine and the honey into the biscuit mixture. Work together using finger tips. 6. Place the fruit in a baking dish. 7. Bake for 25-30 minutes until golden. Cool for 5 minutes and serve.